The Canopy Family understands that photographers have different needs than hard-core birders. The common goal of many birders is to see a good diversity of species, seek out special and rare birds for a region, and spend time enjoying bird behavior. 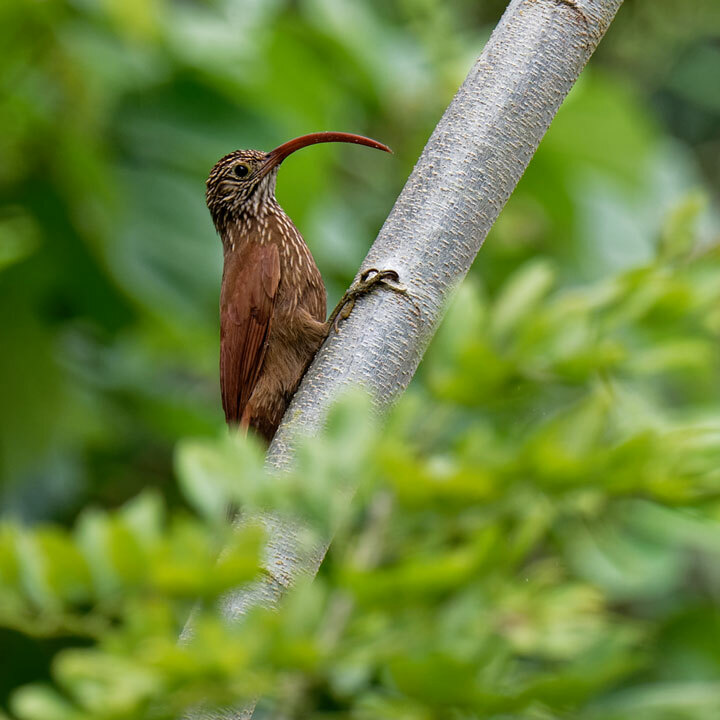 Here in Panama, Wildlife, nature, landscape and bird photographers strive to capture outstanding rainforest photography. Most photographers prefer finding a single setting with perfect composition, waiting patiently for the correct light rather than walking around with heavy camera equipment, and have the benefit of a one-on-one skilled guide able to bring in the birds close and ideal to photograph them. We also understand that even a carbon fiber tripod, when carrying an eight-pound 500mm glass lens attached to a pro DSLR would inevitably constrain the walking range of anyone. How do we counter this issue? Well, instead of taking the photographer to the picture, we take the picture to the photographer. You only have to step outside your room to go on an amazing photography expedition! We are very excited to welcome all photographers. Our standard group size for birding tours are 8 participants per guide. We understand that the interests of birders and photographers vary greatly, and if you are a serious photographer with set goals for your visit, we highly recommend considering to request a private guide who will be dedicated to your needs on a photography expeditions. What’s in store for photographers at the Canopy Family? 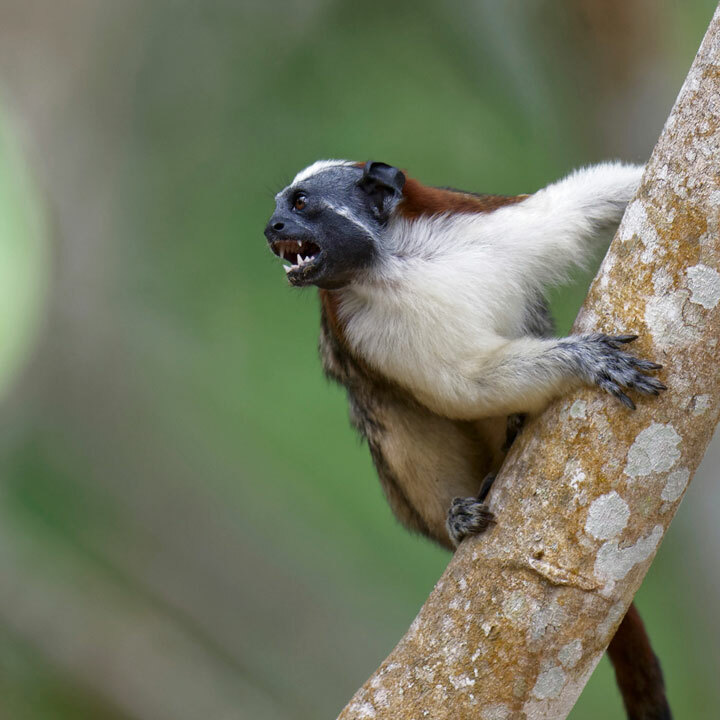 The Canopy Tower lounge and observation deck are ideal places to set your tripod and camera in comfort, while a variety of monkeys, sloths, iguanas and birds are close enough for great eye-level rainforest photography. Some of our photographers even decide to spend most of their time here — and it’s no wonder why! With wireless internet, a PC to download pictures, cold refreshments at hand, couches, hammocks, your room just one floor down, and having wildlife this close and intimate — all makes for an ideal photographic vacation! On the ground floor, we also have hummingbird feeders abuzz with activity. Here you will get great shots of perching hummers and maybe even that one-in-a-million spot-on flight shot! At night, the observation deck becomes a great place to take pictures of star trails. Also, from the observation deck the sunrise with the surrounding forest dotted with patches of fog and clouds make for great rainforest photography. In the distance, the Bridge of the Americas at the Pacific entrance to the Panama Canal, and the Panama City skyline with its unique towering skyscrapers, also make wonderful photographic subjects. Just off the veranda, a variety of feeders (hummingbird and fruit feeders) sit in the gardens only steps away from the guest rooms. The feeders have stumps and moss to provide natural perches for the birds, and can be further camouflaged to make for an ideal setting for wildlife photography. There are also plenty of flowers and fruit on the Lodge grounds, planted in such a way that the morning provides good natural lighting. The plants also attract many species of birds, mammals and butterflies up close, so you do not have to travel far to seek out photo subjects. 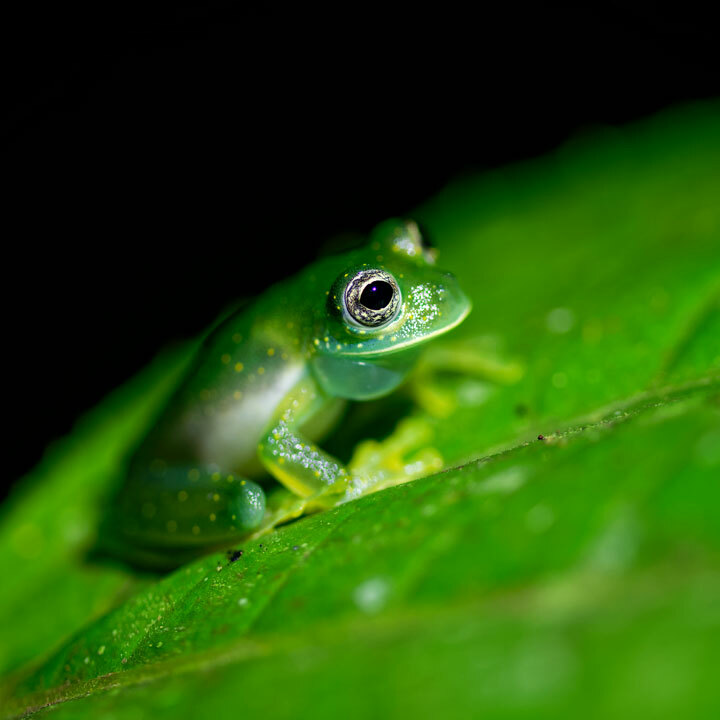 After dark, the Canopy Lodge grounds become hopping with amphibian life—many beautiful frogs can be found in the varied habitats just feet from your room, ideal subjects to test out your macro lens. Hummingbird feeders at night commonly turn into bat feeders, with Orange Nectar Bats making their nightly rounds. The ideal location for photographing Darién’s exquisite bird life! Right outside your comfortable tent, a deck gives ample view for setting up a tripod and camera. From your private deck, you have spectacular views of the adjacent forest and towering Cuipo trees. An open-air lounge with hummingbird feeders and fruit feeders nearby is a great place to set up for photographing the wildlife. With ample space for tripods and cameras, many of our guests would be happy spending their days without moving from this spot! Focus on hummingbird photography at dozens of verbena bushes which attract several species of hummingbirds along with other nectar-feeding birds and butterflies. Benches and shady areas make this area a very comfortable place for extended photography sessions. 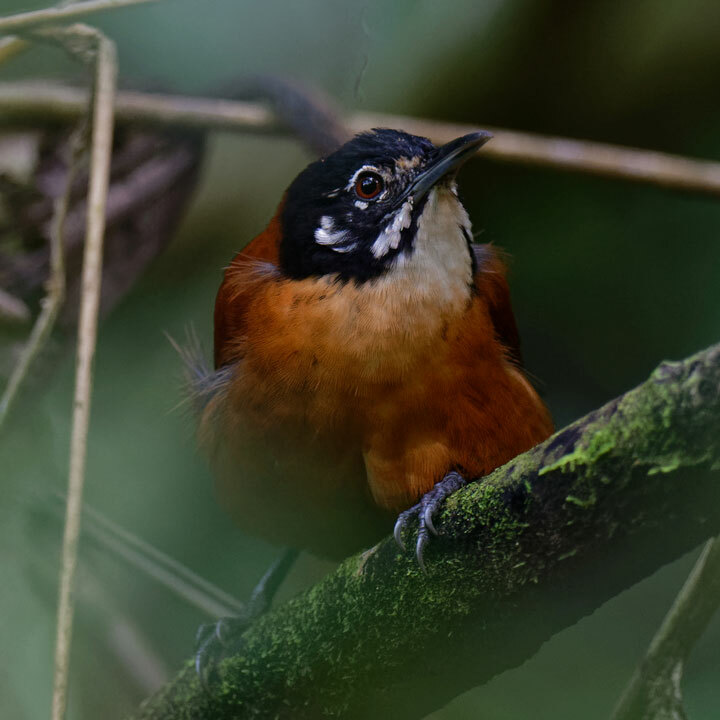 With the right photography equipment for forest and low light conditions, a nearby trail is an excellent place to set up with focus on manakin leks to capture their elaborate dances. In the Embera village, local artisans display colorful, hand-woven baskets, plates and masks, Cocobolo wood and Tagua Nut carvings depicting the flora and fauna of the area, and brightly colored fabrics worn by the Embera women. Photography expeditions here offer charming photographic opportunities of the local culture of Darien. Taking photos in the tropical rainforest is challenging on many levels. The biggest challenge is the ever-changing light in the different levels of the forest habitats and surrounding areas. The understory and forest floor can be very dark, especially on a cloudy day. If it is sunny, the contrast between the bright patches and the shadows is immense. In addition to the light, the photo subjects themselves – the birds – present challenges. 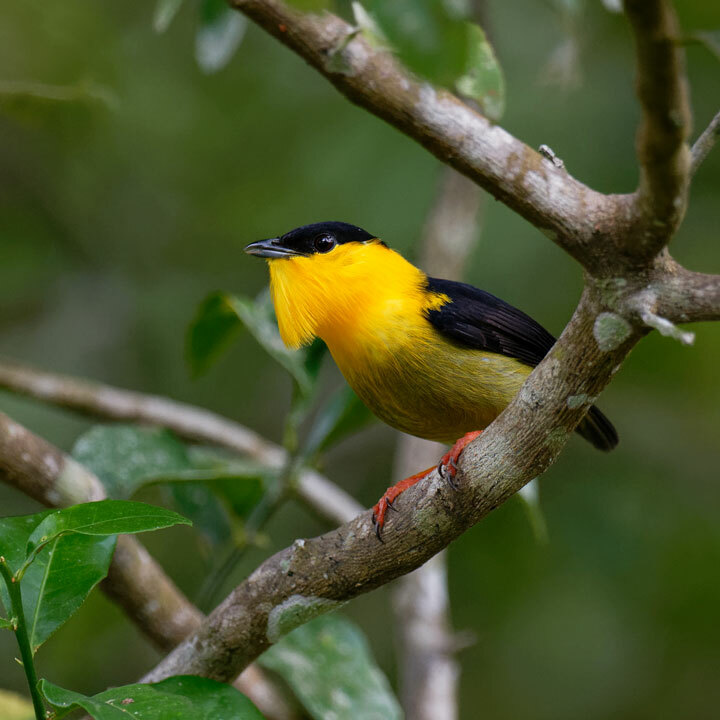 They can be hidden quite well, many of them are small and move fast high up in the trees and if they do not show up even the excellent guides of the Canopy Family cannot help. Everything is in motion and almost every time there is a small branch or leaf in view, obscuring important parts and/or fooling the autofocus. But also watch out for the background: a white sky is always problematic and large white spots behind the bird can turn a potentially great shot into something for the trash bin. Even if you are excited to see a bird for the first time, take a moment to reposition yourself for the benefit of a better background. Despite these challenges, it is possible to make great shots in the rainforest. A modern DSLR may still be the best camera for these conditions. The high dynamic range combined with low noise, an excellent autofocus and high frame rates makes it the camera of choice. However, some of the latest mirrorless cameras probably deliver the same performance. 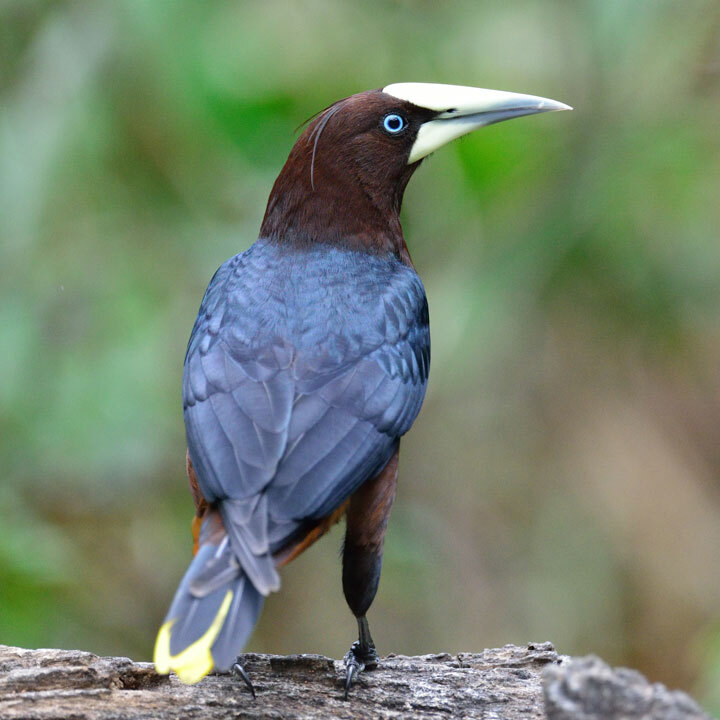 To take superior photos of birds in the rainforest, you absolutely need to know how to handle the autofocus on your camera, blindly, because without the right focus-level every picture is unsatisfactory. Therefore, it is essential to know how to change between different settings without going through the menu every time. 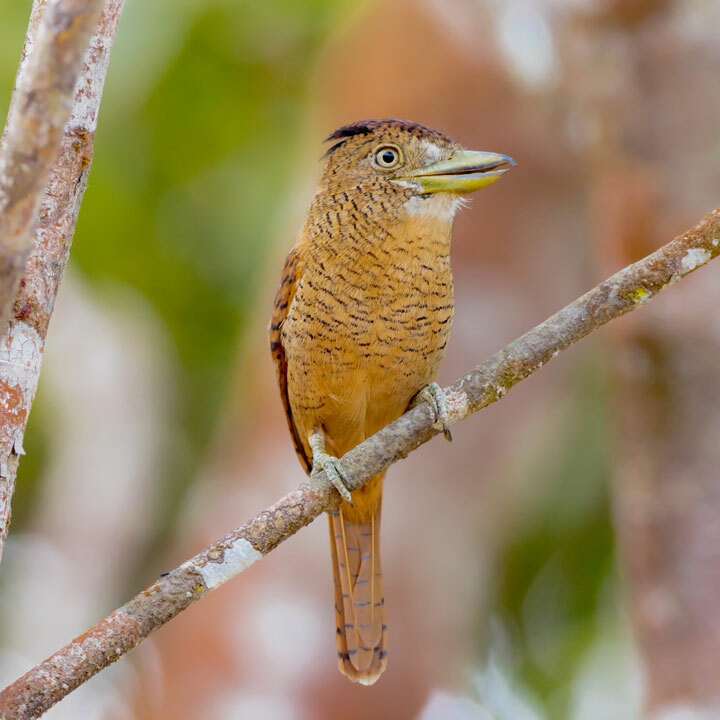 While using the Group Focus (Nikon) is recommended for most birds in flight or standing freely, the single point AF (of course in combination with continuous focusing – remember, everything is in motion) is probably the most used AF mode in the rainforest itself. Most cameras allow the user to customize the function of certain buttons so it could be helpful to assign the most used function, ie. single point AF, to one of these. We recommend to practice the use of the different AF functions before going on a birding/photo trip. The shutter speed is another setting to keep an eye on. A slow shutter speed leads to blurry pictures. Even if the use of a sturdy tripod gives you a stabile platform, the birds and the branches might move just enough to have some motion blur in the image. An ultra-fast shutter speed will increase the ISO and the picture will get more noisy. It is best to try to find out which shutter speed you can use when handholding your camera-lens combination, and use this as a starting point for shooting. 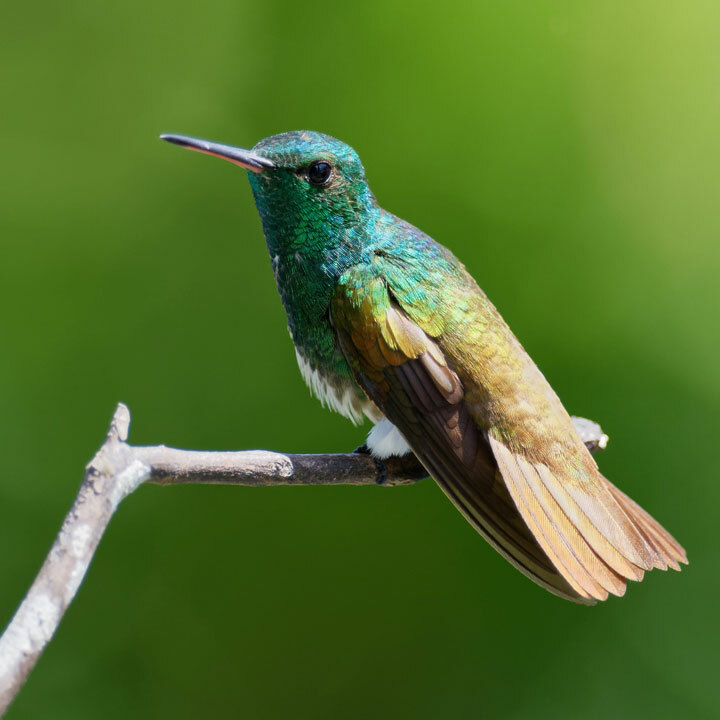 If there is enough light or you need to capture some action, such as a hummingbird in flight, adjust the shutter speed. Most of the time you will shoot with the maximum aperture of the lens anyway, therefore the S or M mode (with aperture set to “wide open”) are the preferred modes for bird photography. Shooting in the rainforest is a constant balance of finding the best compromise between ISO and shutter speed. Most modern DSLR deliver stunning results at high ISO therefore the setting should be set to Auto ISO and the shutter speed can be adjusted when needed. Depending on the camera and personal preferences, one can set an upper limit for auto ISO. But, of course the dynamic range is significantly lower at higher ISO, even if the noise can be dealt with when using some of the latest software tools. Because a lot of times the camera settings are different each time you take pictures, it is very important to recheck the settings frequently – while you are in the car on the road to the next stop or walk down the path. Be prepared to get out and start shooting. The reason is that many animals will not directly flee when you start to take pictures, but they will briefly look at you, turn around and move on. 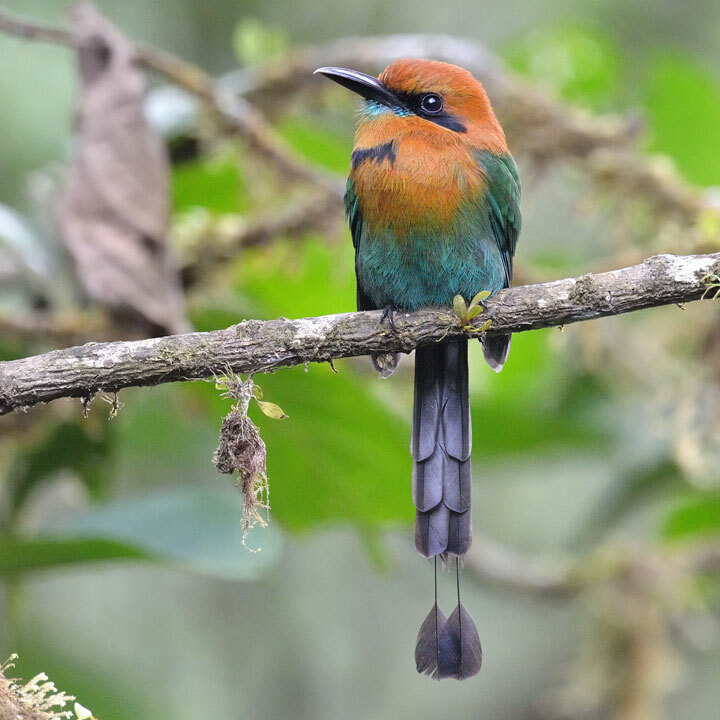 So, if you fire the first shots while the motmot poses perfectly only later to find out that the settings are completely off, we can assure you this will damp your mood quite a bit. If you have any question specifically regarding photography at the Canopy Family lodges, feel free to send an e-mail to photography@canopytower.com. Wildlife photographer Arthur Morris hosted a workshop at the Canopy Tower and Canopy Lodge, focusing on techniques, lighting, set-ups for photographing hummingbirds, macro photography (great insects here!) and more.